2017 is a wrap! It’s been 12 months since I made a resolution to work on my art consistently, and make things I love. It hasn’t been easy, but it’s been incredibly rewarding. I’ve heard it takes about 30 days to turn new behaviour into a habit, and I’ve found that’s pretty true for my art. I made myself a trello board for my home projects, and every time I finish a piece I go check my backlog of ideas to see what I want to work on next. It’s become natural to me to find time in my day to work on my art, even though my time is limited. With commute, I’m at work for 10 hours of my day, and my art practice has to exist in the time outside of that. I feel pretty proud looking back on everything I accomplished in my free time! Unfortunately, I’ve also struggled with burnout this year. Circumstances out of my control meant work has been a lot more stressful than it has been in the past, and I’ve been feeling guilty and restless for not working harder on my own time when the exhaustion hits. 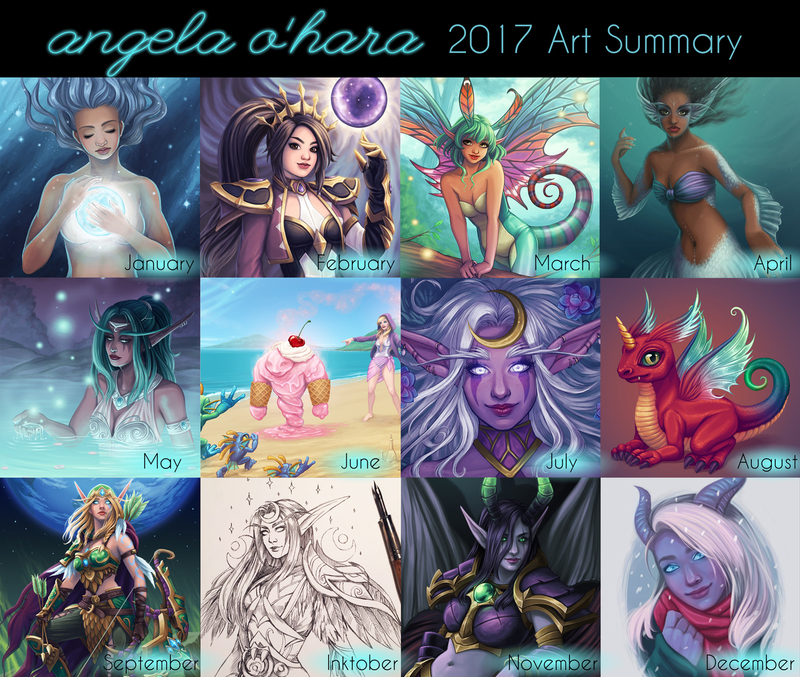 I also took on a lot of projects this year, from Comicon to an art show to contests, and it’s had a real effect on my mental health. My resolution for next year is going to be to continue making personal art as I have, but place more importance on my own mental health. I already turn down a lot of work opportunities (mostly commission requests), but I am going to try to be more selective with what I take on in 2018. I’m also hoping to exercise a little more and give myself more time to rest. I’m so excited to make more art in 2018 and see the progression in my skills. Now that I’ve made space in my life for creating personal art outside work, I can’t imagine stopping. Here’s to a great year of art!